This was written in response to a recent query I received and I thought it might be of broader interest so I am posting it on my blog. Measuring and reporting is about value, about understanding it, about creating more of it and creating it more efficiently. I don’t write about compliance-based reporting. I leave that to others more qualified. My guiding principle is to use Impact Measurement and Sustainability Reporting and Communications to drive value, impact, and results. My approach not to be prescriptive in terms of structure, content, and style. What is critically important is value and reporting and measurement should add to value, not detract from it. I don’t intend to replace structural frameworks like GRI or other more compliance-based approaches. There are often (but certainly not always) valid corporate reasons for using them. I try to speak to the needs of the on-the-ground and immediate stakeholders, whose needs and interests are too often left out of the equation. Reporting and measuring should flow from the project itself, from the unique value propositions inherent in the project and the pragmatic needs and interests of key stakeholders. Reporting and measuring should be about ensuring that value is delivered, and delivered efficiently. Wherever possible they should facilitate value alignment and steer away from zero-sum approaches. There is no universal answer for that, nor should there be. The process must be driven by the situational reality of the project, the key stakeholders and the value-propositions behind the project. The process should be pragmatic and the data gathered and reported on should help participants and stakeholders understand the value that has been created and help them to become more efficient in creating future value. I want to be clear that I am not speaking to compliance-based reporting and communications. For the most part, each one has its own prescriptive structure and format. Often they are of little or questionable value to the on-the-ground participants and stakeholders. That isn’t to say that they are unimportant, or wrong, just that the value propositions for those reports are generally focused at higher corporate and organizational levels. 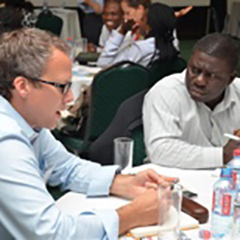 Reporting and communication must also create value for on-the-ground stakeholders and participants. Again, I do imply that companies should not do the compliance-based reporting – but I certainly do advocate for them to look closely and ensure that it is meeting a real value and strategic need, and not just some check-the-box feeling of accomplishment for someone who is unclear of the relationship between social responsibility and value creation. I’ve found these touchpoints to be key in developing and using sustainability communications and reporting to drive value. 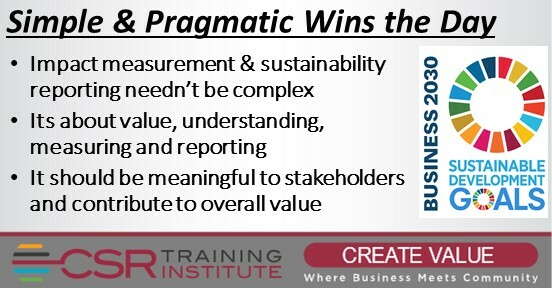 Sustainability measurement, reporting, and communications should be about value, not about check-the-box compliance. It should be strategic, pragmatic and should support the value-propositions that led to the creation of the project in the first place.